Last summer whilst out kayaking on the river I chanced a trip up Ballycanvan stream, which leads up to the ever popular Jack Meads at Halfway House. I made the trip in an effort to track the route of the Lighters that would have supplied the Kilns at Jack Meades with limestone rock to burn. Not long into the trip however I came across a curious narrowing of the stream which was obviously man made as it was achieved with cut stone. On getting out to investigate I realised I was looking at an elaborate structure, with, at its centre, an old watermill. What I found most intriguing was that it was in design, very similar to the Saltmills at Dunbrody, as described briefly in last weeks introduction to the mills of the area. I’ve sketched the scene in an effort to try explain it better, and hopefully the photos, above and below, may assist too. Essentially at the high water, two sluice gates were closed to effectively dam the stream and hold the water back. The stream was held back or “impounded” until the tide had ebbed away below the dam, and then the water was released under the vertical mill wheel, which turned the wheels to grind the corn. The water passed under the wheel (undershot wheel) and would disappear down a “tailrace” to return to the stream. You might note a smaller sluice or “spillway” about 2 1/2 feet wide on the sketch which was in place to safely release the water if required, for example in times of spate/flooding or when repair works were taking place. Now visiting the mill is problematic for two reasons. One its in an extremely bad state of repair, with a lot of fallen stone. Secondly its currently overgrown and on private property, the site being owned by Dr Robin Kane. I met Robin recently and he happily showed me round the site. Not alone was I thankful for access, but I was also thankful for the mine of information he had about the mill. The mill itself is a fabulous old building, whatever it’s state of decline. Some sections were actually built on bedrock which rises to over 6 feet in parts. We could count three floors and we speculated that a loft space possibly made it four floors. The floors were traditionally called from the ground; Meal floor, Stone floor, Bin floor & loft. The windows are falling in so counting the floors required looking at the spaces for rafters in the walls. Getting the corn into the mill was probably helped by the roadway that ran to the rear of the building, which was effectively two floors at least above the ground floor. There were several other parts to the mill site, the two sections beside the mill were obviously built at different stages as the stone work is different and none are keyed into the other. Beside the mill is what looks like a kiln area for drying corn and beside that was another large building perhaps a store and/or office space. Another two storey two roomed building was built less than 50 yards from the mill further up the stream on the roadway that used in the past stretch to Halfway House. Another structure apparently hewn from rock was to the rear, now overgrown and which we thought another storage area, perhaps for coal as fuel in the kiln. Robin understood that the three sections had been built at different times, confirmed really when looking at the construction from the stream side. His information suggested dating from Cromwellian times. 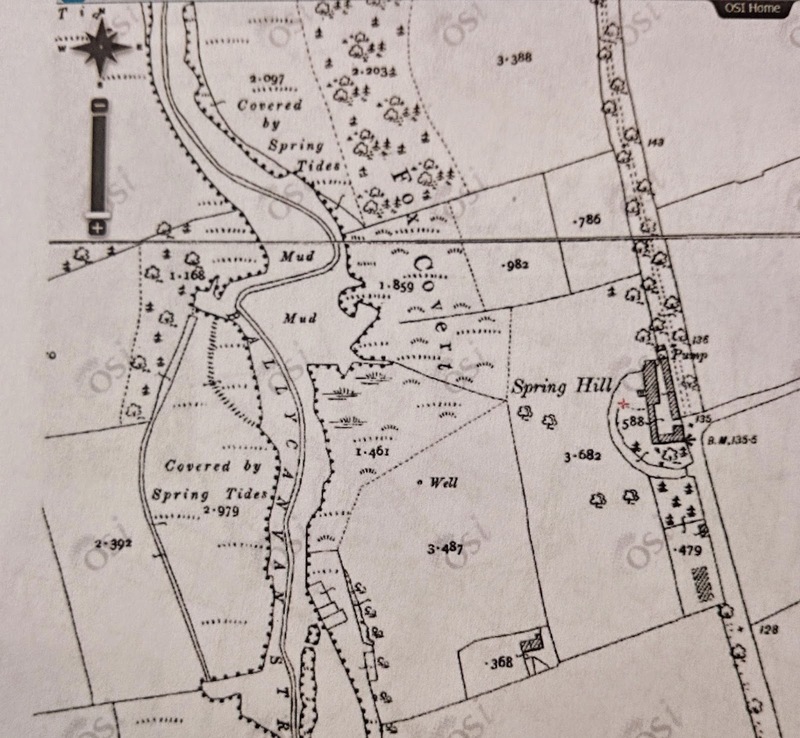 Although Captain William Bolton took the area from the Aylwards he did not have a reputation for investment in the property, although that certainly changed with his Grandson Cornelius Bolton, the elder, who I would suspect may have been the builder, but perhaps I am wrong. 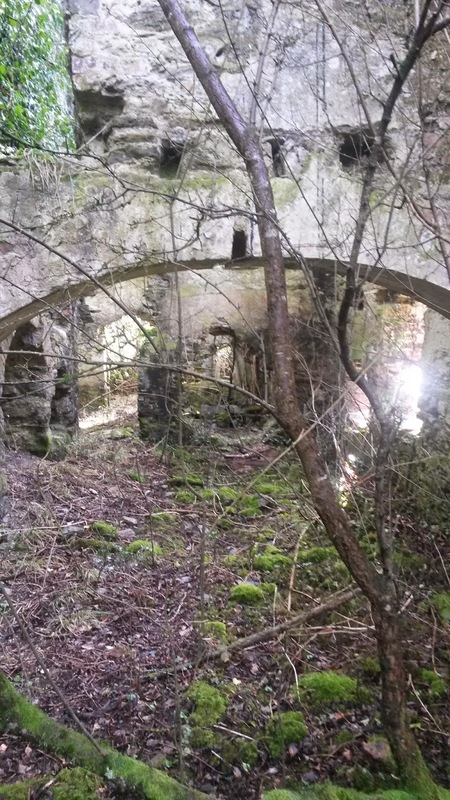 Having never actually heard of the mill previously, I speculated that it must have been abandoned many years ago. Again Robin’s information was that due to siltation from the river, note the mud is some photos, that it was abandoned in the mid to late 19th Century as it continually clogged up the wheel. * Interestingly, there was no sign of a “tailrace” where the used water flowed back to the stream below. It’s hard to say if there was a pipe now buried with silt or whether it was an open cut which over time was backfilled, but I tend towards the former. Robin had also heard that when corn was plentiful, or perhaps if the mill wasn’t operational, corn was taken upriver to be milled elsewhere in Waterford and indeed up the Barrow. I could imagine that at times of neap tides, sufficient water might be hard to store up in the mill pond. Perhaps another reason for it’s early demise. A final negative factor was that undershot water wheels were notoriously less efficient to run than overshot wheels (where the water was fed over the top of the wheel). And there was an overshot fed wheel in the area. 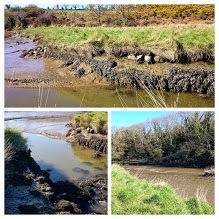 It was just upstream from Ballycanavan and we will pay a visit to this next week. Information on mills taken from Watts M. Watermills. 2012. Shire publications. Oxford. * More recently I discovered a new article from the 1850s describing how the former mill was being used to recycle rags. Apparently the mill wheel was used to crush and rip material, the strands of which was subsequently rolled into balls and sold on. In years gone by, rural communities depended much more on local resources to sustain themselves and in agricultural terms mills highlight how important grain was as a crop. At home my grandmother told me they had a hand turned mill, the base of which is still in the garden. But commercially larger mills were a requirement. Growing up around the river, one of the many interesting placenames was glasshouse Mill. Often whilst waiting a drift for Salmon on the ebb tide from the Binglidies we would take a walk in around the ivy clad structure and marvel at the scale of the building. But in recent years I’ve come to realise there were many such structures locally and some very old, which are worthy of recording. Now although Glasshouse Mill was on the Kilkenny side of the river, in days gone by, boundaries were not as big a factor when determined by the river, because the river was the route by which the locals travelled. Therefore although I will also mention Wexford in this piece, its because of their closeness and accessibility via boat that they deserve to be included. 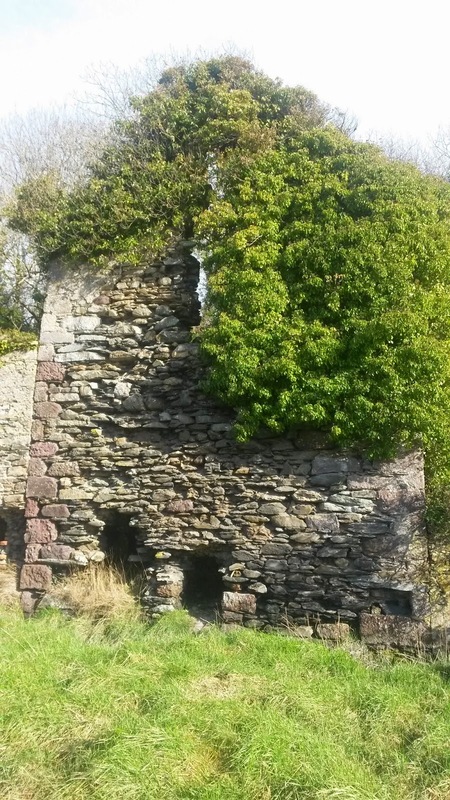 For example, the oldest known mill in the area was at Kilmokea on Great Island. 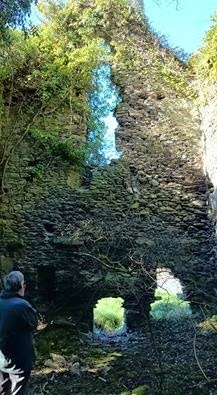 Kilmokea was a early Christian monastic site and a horizontal mill driven by water was known to exist there. (Colfer p.26) The monks were also skilled in the making of millstones, which were hewn from suitable rock in Ballyhack, Drumdowney and I imagine it was quite possibly they who tried to extract a millstone on the Minuan, the stone where we as children played the knights of the round table. A fascinating excerpt on the mill from Horseswood National School is here. The Knights Templars received grants of land in the area after the Norman conquest. (Byrne pp 101-107) The Templars came into being during the crusades and brought many new ideas and products including building techniques and technology back from the east. These technologies included improvements in milling and windmills. 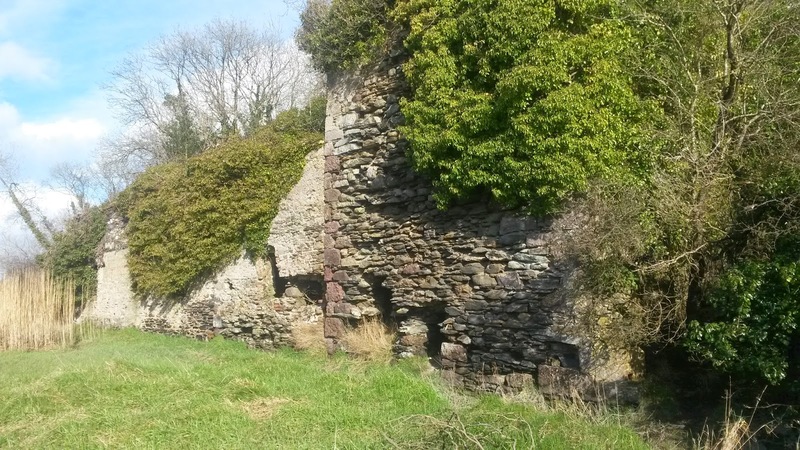 Interestingly though, Niall Byrne states that the Templars were granted an existing water mill in Waterford (on Johns Pill) and Jim Hegarty in his own publication states that they inherited a windmill on the hill of Passage East at Cuoc-a-Cheannaig and that this would later be known as Nicholsons Mill. (Hegarty p.7) I remember either reading or hearing of the Aylwards having a Mill in the area, I presume this it is the Passage windmill they refer to, which they possibly “fell in for” following the suppression of the Templar order. The Templars used the Mills as a means of generating income, as did those who followed them. Essentially the peasants working the land paid for the right to live there, to grow crops and also paid for the milling of their corn. I’ve also read somewhere that they paid a fine, if they did not have grain to mill. Talk about a double bind! Other mills were located at Dunbrody Abbey, on the Campile pill. Known as Salt mills they used the power of the tide to drive the vertical mill wheel (Colfer pp 62-64). The process was relatively simple. When the tide was at high water, the water was held back by a dam, and when the tide went out it was released into a millrace which drove the wheel and which ground the corn. The two other mills that we know of come from the Bolton era I would imagine. 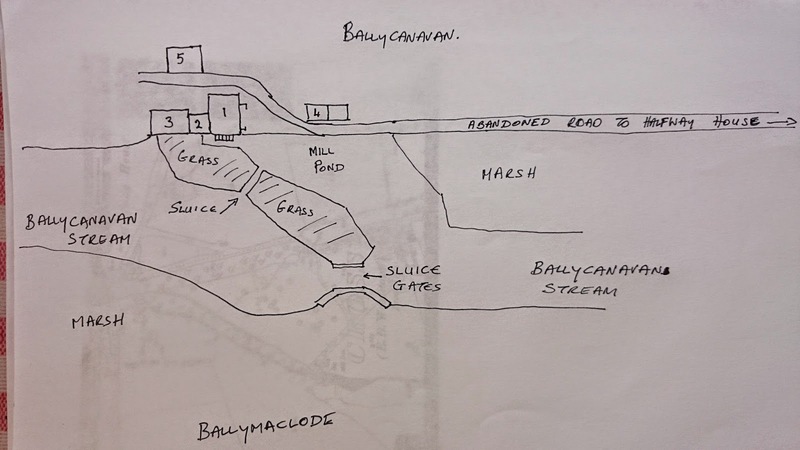 One was at Ballycanavan and was driven in a way similar to the Saltmill described above. The other was at Half Way House, take a look to the left as you come under the bridge heading towards town. Both these mills were facinating in terms of their operation and over the next two weeks I will describe each. Colfer. B. The Hook Peninsula. 2004. Cork University Press. Cork. Hegarty. J. Time & Tide. Self published history of the Passage and Crooke Area. of my childhood, and particularly the 9am mass at Faithlegg Church. On reflection I guess the mass stands out, as in those days before it became a “festival” it was much simpler of an affair. We also didn’t have a car, so no parade. It was a day off, which like so many others we spent out rambling, and if unlucky and it rained we probably had to re-sit a of Darby O Gill and the little people or Quiet Man re-run. plenty of green white and gold. I read recently that the badge went back to the Irish soldiers that fought in the trenches in World War I. We cold look forward to a break from school, and also a break from lent. Lent then generally meant no chocolate, or sweets, or one of my favourites; Tayto crisps. I remember one Paddy’s day being almost sick after gorging myself on bags of Cheese & Onion. we were about to go out the door, in case t’wud wilt before we got to mass. a marked pride in the display of the trinity leaf. the lapel with an eye to detail. of Shamrock that would have fed a sheep. the trip around the village. he managed to keep it fresh looking. ceremony on that day always appealed to me. celebrated something that made us proud to be Irish in a country that at the time, probably didn’t have a lot to be proud of. And in standing to sing, it was almost like singing the national anthem. For a few short years it was the central meaning of the day for me. In last weeks blog we met the Bolton family of Cornelius Bolton the elder, through the visits and writings of Arthur Young. At this time the families activities were generally of a pastoral nature. In a few short years however they would shift to an industrial focus, which would lead to a boom time for the area, but alas like all booms, there would also be a bust, and in it, this particular developer would lose all. who died in 1779. In succeeding his father, Cornelius the MP was to become a serious businessman. He would also be an MP for Waterford on several occasions and would hold several other posts including Mayor and Sheriff. Below is a brief list of the achievements of both Boltons, as I find it impossible to separate the activities of one from the other regarding the earlier developments. This is also incomplete. As two of the items were only added in the last few weeks. I imagine it would take serious historical research to unearth all that the Bolton’s were involved in. for him to oversee the work. There may be another connection, but one I only heard of, that Bolton paid for the spire on the protestant cathedral. of poor quality, no Cobalt was found. The ending of the Napoleonic wars led to a slump in demand for textiles. The 1798 uprising and the the act of Union must have also impacted. Perhaps the biggest impact was the shifting of the mail packet station downriver because of the delay in getting the ships to Cheeekpoint. to repay part of his debts. 199 years ago this week. courtesy of Micheal O Sullivan Waterford History Group, without whom I would not have known this specific detail and who I would like to thank for the title. 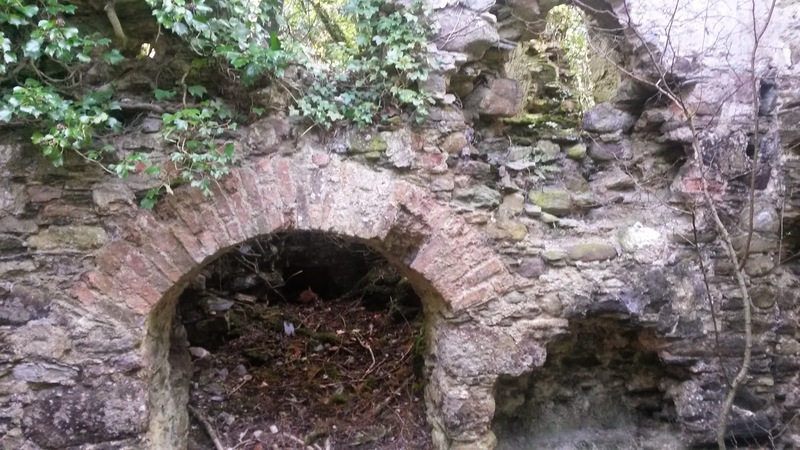 Various people will have helped me with information for this piece who I can no longer recollect, but most recently Gerry Boland gave me some info on the Faithlegg Kilns which I was not aware of.